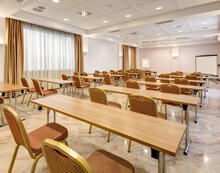 The Park Hotel Roma Cassia is a 4 star hotel located to the north of the Vatican and Rome and offers 96 rooms available in the twin, double or even triple varieties. 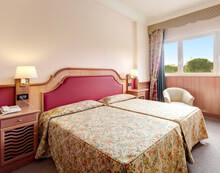 Rooms also enjoy views of the expansive hotel garden, the city of Rome or the gorgeous countryside surrounding the hotel. Why not take a look at our Photo Gallery for a greater appreciation of what you will find at the Park Hotel Roma Cassia. When completely satisfied, use our secure online booking systems to book your room today before you miss your chance! We can also offer tourist and booking services to help you with guided tours, transport tickets, restaurant and theatre reservations in addition to general information. 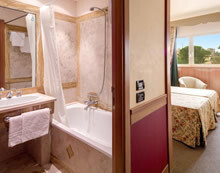 Private en-suite marble clad bathroom with shower or bathtub, complimentary toiletries and hairdryer.